One thing that can be said, LEGO’s are insanely popular in this house because for one, my Hubby was a LEGO kid growing up and absolutely loves LEGO’s til this day and our eldest daughter loves building them too. We are ALL huge SpongeBob fans too, so this is the best of both worlds! 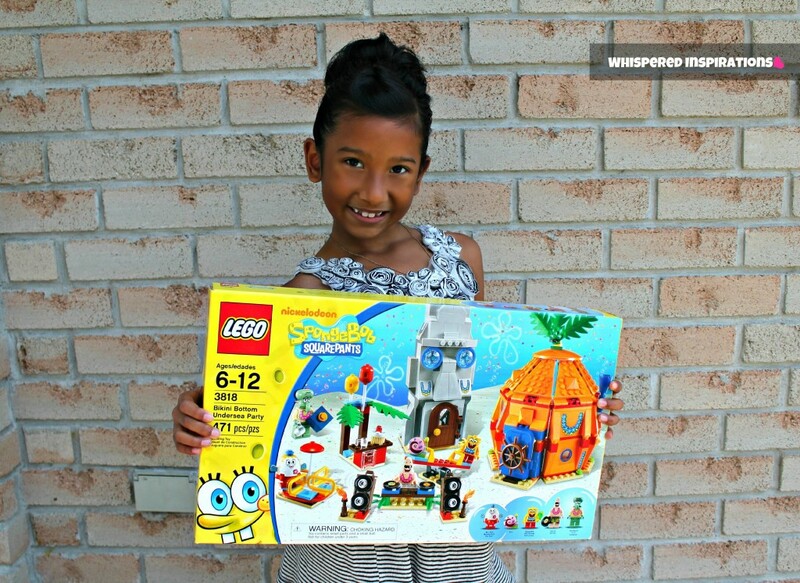 As a Nickelodeon Mom, I was super stoked that I was sent the LEGO SpongeBob Bikini Undersea Party Set to review and it came just in time because it was the long weekend and well, I was stuck at work. This was the perfect time for them to start the fun and embark on many adventures when they were done! SpongeBob’s house and Squidward’s house. 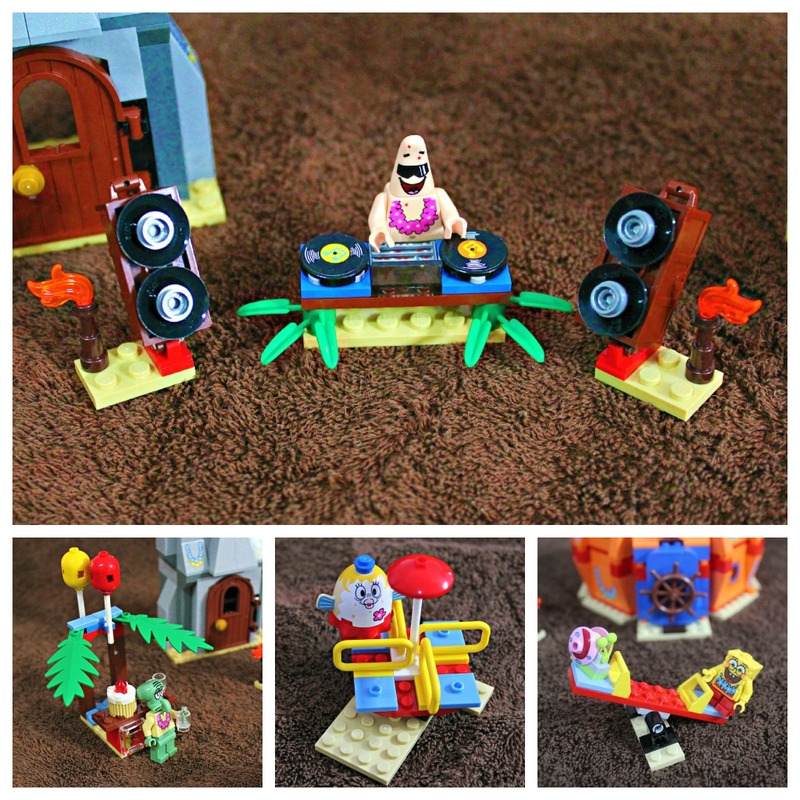 4 mini-figures: SpongeBob, Patrick, Squidward, and Mrs. Puff. Tons of fun and imagination! Includes 471 pieces and is recommended for children between the ages 6 and 12. This Set is Super Fun! It includes SpongeBob, Squidward, Patrick, Mrs. Puff and Gary the Snail! SpongeBob’s famous pineapple is there for them to enjoy. As well as a merry-go-round and a teeter-totter. Patrick lays down some tunes to sway with as he DJ’s behind the turntables. Squidward is there to provide the refreshments at his juice bar. SpongeBob, well–he can make anything fun with his silly antics! You can buy this set at Toys R Us and I guarantee you that it’s a sure hit for SpongeBob fans, Gabs is over the moon! The set took about an hour to complete with the help of Hubby and it’s had hours of fun and adventures since. Gabriella says that she enjoys playing with SpongeBob and his starfish best friend Patrick! She loves to pay moody ole Squidward a visit and make meowing sounds with Gary the Snail. This is the perfect set for school-aged children. It really allows them to bring their favorite Nickelodeon cartoon to life. 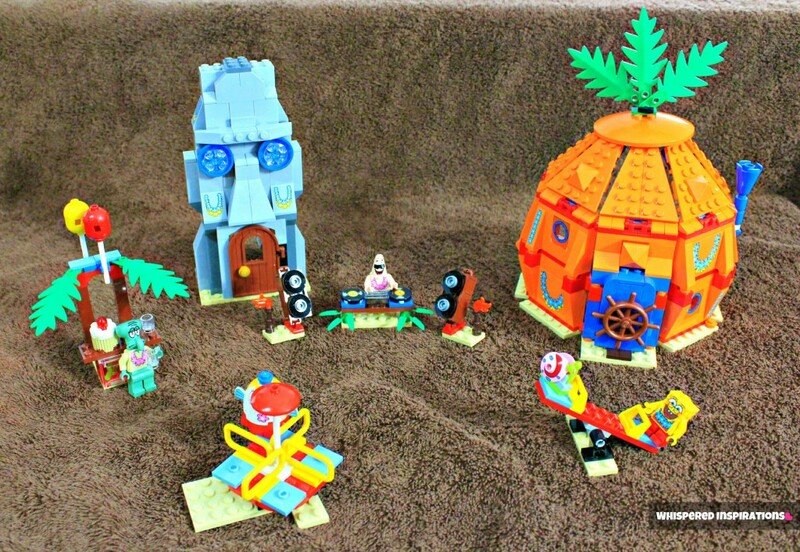 Plus, allows them to have free range on all the adventures that silly SpongeBob will have with this amazing LEGO set! Her favorite part was, of course, the characters. Those were the first to be assembled. The pineapple under the sea was also a favorite and she saved that for last! Here is the full set after it was all finished, Gabs set it up as if they were really under the sea with faux sand and all. The party was on in full force! It was also so very entertaining to hear the adventures that she was having with all the characters. The dialogue and conversations were a hoot! She’s been playing with the set every day throughout the day and I’m happy because she is setting her imagination free, built dexterity while assembling it and best of all–she is having fun! This is the perfect toy to kick off the summer and to keep your growing ones busy, whether it may be TOO hot to go outdoors or if it’s a rainy day! It’s a perfect anytime toy! Remember, you can purchase it at Toys R Us or order it, here. It’s a great set to add if you are LEGO head like us (we love LEGOLAND), and it has so many parts for a great price. Let me know, til then, cheers m’deres! Previous Post: « Review & Giveaway: That’s So Strawesome! Sponge Bob, Babar and Wonder Pets! Isn't this the perfect marriage made in heaven? 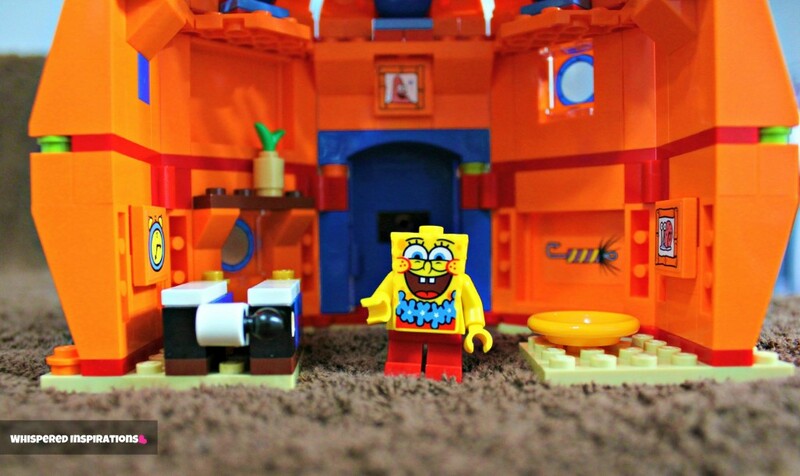 – Sponge Bob and Lego! What a great set. Spongebob is my kids favorite Nickelodeon show. Sponge Bob all the way we even have a DVD! Go diego go is a fav around here. That's a tough question since it depends on which one you ask! Wonderpets and Backyardigans are really liked here. It's all Dora and Diego in my house! I love Lego!!!! its spongebob! she'd love this! My children are huge Sponge Bob fans, they also like the Ninja Turtles a lot, too. My daughter loves so many. Bubble Guppies and Sponge Bob are probably her 2 favorites. By far, it is Spongebob Squarepants!! My grandsons are huge fans and would just be gaga over this set! My charismatic/energetic 8 year old son Evan, watches "Mr Young". My boy loves Team Umizoomi! Sponge Bob has been his favorite for years now! my son loves spongebob hands down! My daughter is a huge fan of Max & Ruby. My kids (especially the older one) love SpongeBob the best! And they are Lego addicts–good marketing move on Lego! My son loves The Fresh Beat Band. My boys like the Backyardigans. iCarly is this weeks favorite, but Spongebob is always high on the list. We don't watch a lot of TV in our house, but we do let our daughter watch Backyardigans. I think it's a good show with a great message. Oops, sorry didn't realize it was Canada only! Please delete my entry! We've also got about 100 different lego set, big and small, collected over the year as my older boy was a lego fanatic! !